Written by Rosemarie Parent from information in the Arrow Lakes News archives and the Society’s book Port of Nakusp. 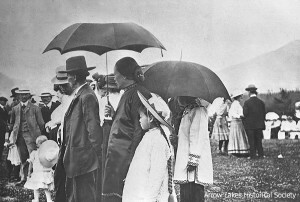 In the late 1800s, the Slocan and Lardeau areas were filled with people of many nationalities, but there were few Chinese. Because the Chinese were known to work for lower wages, the miners, afraid of losing their own employment opportunities, made them unwelcome. 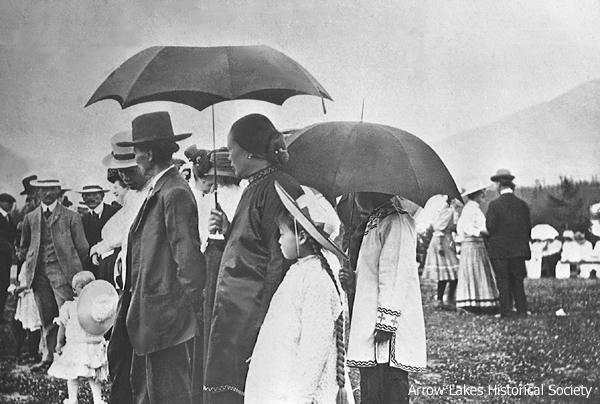 Although Nakusp offered little incentive for Asians to settle here, there were a few who took advantage of the more open-minded climate that existed in the town. One of the most prominent men to come to Nakusp was Sam Henry, whose name was listed in the 1895 BC Directory as having a laundry business on Bay Street. The next time we hear of Henry is in 1897, when he had the vision to establish a market garden to supply the steamers. Near his laundry was a plot of land made up of black soil well-suited to small gardening. Spring-fed, this land produced bounteous crops of vegetables which were gratefully picked up by the new boats on the Arrow Lakes. This was only a small farm. However, Henry had his eye on a huge parcel of land, which he was sure was the best on the whole Arrow Lakes, lying east of his present location. By 1904, Henry finally managed to purchase this 72 acres in one lot and 89 acres in an adjoining one. Also spring-fed, this beautiful earth could produce vegetables at record rates. It was low lying land that produced internal heat, allowing plants to be sown early. This was where the Spicer farm is now (2005) – opposite the marina. Interestingly, although Chinese were not allowed to own property, even after the new land act was written in 1908, records show Henry did own this property. Henry bought the Genelle house in 1911 and moved it off the mill land to the farm. It is still in use on the Spicer property. Barns and outbuildings were erected to accommodate the men, all working the farm. Some were housed in a large frame building, sitting near the Nakusp Trading Store on Bay Street. As many as 20 Chinese men were employed at times, and were a familiar sight when as a group they trotted off to the boats early in the morning with two baskets of vegetables hung from a pole over their shoulders. 1st of July, before 1912. From left – Sam Henry, Big Mrs Sam. Henry had a complicated matrimonial life. As a wealthy man, it was a common Chinese practice to have many wives. 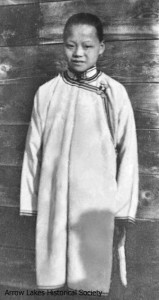 Many believed Henry had left several wives back in China, but no one knew for certain. He did have two wives who lived in Nakusp. His first wife was Yip Shee, a large woman who was always known as ‘Big Mrs. Sam’. She was a very demanding and controlling woman. A son was born to her name Gee, which meant George, in honor of George Jordan – who the family greatly respected. In 1909, Henry took a trip back to China and returned with a young wife, Jung Shee, who became known as Ying. When she had a son named Willie, the little fellow was taken immediately from her by Big Mrs. Sam, who acted as if the baby was hers. Poor Ying was never able to mother her own child. When Henry died, Big Mrs. Sam took charge and sent Ying out to work as a housemaid in many homes around Nakusp. Another young girl, whose name was Faun, lived with the family. She was thought to be Henry’s daughter, but no one interviewed was sure who her mother was. Most thought her mother was one of the wives in China, rather than Big Mrs. Sam. Enid Wensley was the daughter of Fred Wensley, an early pioneer of Brouse. She married Joe Shelling in 1920, for those of you who know her by her married name. She recalls an episode from when she was a young girl. She was on a trip to town with her father by horse and buggy. Arriving in town on a brisk fall day in 1912, they could hear a pounding as they neared the main street. At the corner of Broadway, they saw the most unusual procession taking place. Making their way down the street there were men holding large sticks raised above their knees and then pounded into the sand of the road as they marched along. With them was a group of women with white sacks covering their heads, giving them a grotesque appearance. The town band began to play the mournful piece Dead March in Saul, when a dignitary from the Asian party instructed the band to play livelier music. They then switched to Wolverine March and the Girl I Left Behind Me. Enid’s father smiled as the band changed tunes, and finally realized the significance of the parade. Henry must have died. Wensley lived on a farm and didn’t come to town often, so had not hear the news. A Chinese band from Revelstoke was also contributing to the event with the clanging of cymbals and the rattling of sticks, which were presumably an attempt to scare off evil spirits. The Buesnel brothers wagon bore the casket while Henry was guarded by a lively group of men who were throwing hundreds of tiny perforated pieces of paper in the air. This was another device to keep the devil forces from getting to Henry – the devil would first have to go through every one of the holes in the papers before reaching his body. The procession, which was impressively long, included many Chinese dignitaries from Vancouver. A large group of town residents had joined them out of respect for the influential man. The parade snaked up some of the side streets and then back to Broadway. Upon reaching the cemetery, the whole Chinese contingent – except the horses and wagons – brought Henry back, walking backwards. The whole sequence had been a charade, a mock funeral to convince the devil that Henry was in the Nakusp cemetery. In fact, he ended up in the local funeral parlor owned by Joe Crowell. There he lay in state until the proper time for reburial was reached, thus ensuring his safety and protection from evil forces. It was an ancient custom for Chinese to be buried in the homeland so that the bones could be worshipped by the relatives. They believe that the spirit lived on with the skeleton. In 1927, a group of Chinese citizens in Toronto were busy raising funds to send 400 skeletons back to China. Henry was also to be returned at that time. However, there was a problem, Crowell, the undertaker, had filled Henry with so much formaldehyde that his body refused to decay. Seven years later they tried again, but when they dug him up, Henry was in pristine shape. They tried a third time, but finally gave up and shipped him back to China as is. Crowell found out that another custom the relatives insisted on was the taking of food to the deceased. The top of the casket was open and they laid out nuts and dried fruit around the body. A few days later, another load of food was brought, this time a whole chicken. Crowell confronted Mrs. Sam. “What am I going to do with it?” Crowell retorted. She shrugged her shoulders. Crowell and his family ate like kings for the two years that his body was in the undertaking parlour. It wasn’t until 1922, 10 years after Henry died, that Clem and Phil Buesnel bought the property to set up a fine dairy farm, named Bay View Dairy. This was the main section of the estate. By this time a great deal of the land had been sold for houses, especially along Nelson Avenue. Henry had proven to be a fine business man during times when the Chinese were not allowed to do so. For years, he supplied many residents and the paddlewheelers with fine vegetables and was a much respected member of the community.